Pioneer’s line of in-dash multimedia receivers, which were previewed at this year’s CES in Las Vegas, are now available for all through select retailers and online at Pioneer’s website. These units run Android Auto, Google’s OS for vehicles, but also come with Apple CarPlay compatibility built-in, allowing for complete flexibility for a family that runs multiple platforms. 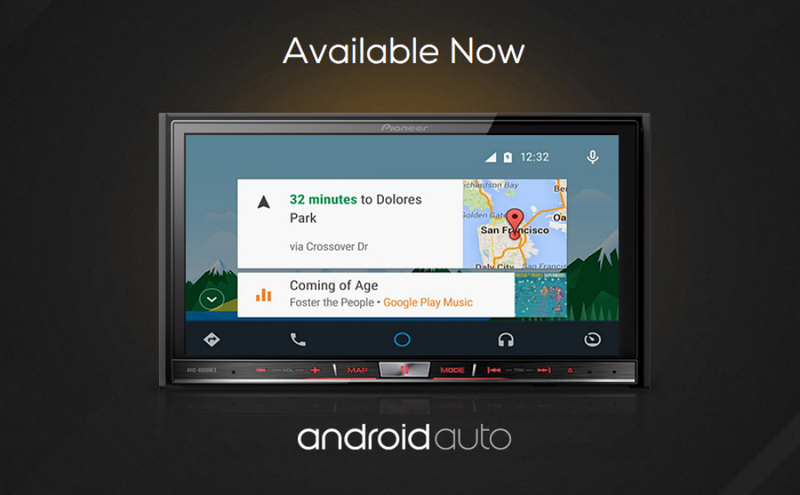 There are three different Android Auto-compatible models, ranging greatly in price. The low-end model, which is the AVH-4100NEX, runs at $700. It features a 7″ WVGA resistive touchscreen display (800 x 480), which is good for anyone who needs access to Sirius radio and Bluetooth connectivity. The high-end model, being the AVIC-8100NEX, costs $1400 – double the 4100NEX. The 8100NEX features a 7″ WVGA capacitive touchscreen, which allows for a much better tapping experience while driving around. This model, too, features Bluetooth, CD, SD, and USB music playback. The middle model is the AVIC-7100NEX ($1,200). If becoming an adopter of Android Auto interests you, it isn’t cheap. On top of purchasing the necessary hardware, unless you have a background in installation of units such as this, you will likely need to pay a tech to install it. And that’s never cheap. If all of this seems fine to you, many retailers are now carrying these units, so to find one near you, check the retail locator right here. LONG BEACH, Calif. (March 11, 2015) – Pioneer Electronics (USA) Inc.’s second generation Networked Entertainment eXperience (NEX) in-dash multimedia receivers introduced at the 2015 Consumer Electronics Show are now available at authorized Pioneer retailers across the country. The 2015 NEX line includes theAVIC-8100NEX, AVIC-7100NEX and AVH-4100NEX, the first products to offer consumers both Android™ Auto and Apple CarPlay™ connectivity to provide maximum smartphone connectivity flexibility. Two additional models, the AVIC-6100NEX and AVIC-5100NEX, offer only Apple CarPlay compatibility. The NEX line of products also feature advanced Bluetooth®1 capabilities, AppRadio® Mode, MirrorLink® compatibility, iDatalink® Maestro™ support and enhanced audio/video capabilities including Pandora® internet radio, SiriusXM-Ready™, and FLAC file playback. The Pioneer AVIC-8100NEX ($1,400 SRP), AVIC-7100NEX ($1,200 SRP), AVIC-6100NEX ($900 SRP), AVIC-5100NEX ($750 SRP) and AVH-4100NEX ($700 SRP) are currently available at authorized Pioneer retailers across the U.S.